Steorn published a new video on their Facebook page today, in which CEO Shaun McCarthy explained the internals of the OCube and described the problems that have been encountered in shipping them so far. McCarthy states that there are now about 20 Orbo-powered products out in the “real world”, and the failure rate so far has been 40%. For the OPhone, the failures have often been with the standard mobile phone electronics, for example in two cases the speaker has become detached. These have been repaired. The problem affecting the OCube is different, and before explaining it, McCarthy demonstarted all of the components that now make up the OCube. These differ substantially from what was shown in earlier videos over the past few months. The voltage reference source is connected to 8 Orbo powercells, organized as two bundles of four cells each. In contrast, the OPhone contains only one Orbo power cell. The power cells output to a controller chip. While the output from the power cells exceeds 1.6 volts, this chip will output 5 volts. The controller chip outputs to a lithium ion battery, to recharge it. The Li-ion battery outputs to a standard USB post. When a device is plugged into the USB port, it drains the Li-ion battery. Once the battery’s voltage decreases to about 2.9 volts, the rest of the system begins to recharge it, and does so over the course of about 12 hours. In certain circumstances the current draw from the Li-ion battery is too great and the chip is blowing. That results in either the Li-ion battery completely dying, i.e. there’s no energy passing through this circuit, or, more importantly from a safety perspective, that this is effectively just open shorting and we’ve had two cases where the Li-ion battery is charging to 9 volts. And obviously that is a relatively unsafe level. McCarthy anticipated (with good reason) that a lot of attention would be given to the fact that the OCube contains two 9 volt batteries. He explains that the megaohm resistor between them prevents all but the slightest current from flowing (15 to 20 microamps), and that the purpose of the batteries is not to provide power. At that rate of draw, the batteries should have a lifetime of 5 to 10 years. What we’re testing at the moment are systems that have no Li-ion batteries. We have 2 or 3 systems that are currently in test and with a modification to the controller chip setup. We’re going to test those for the next 2 or 3 days and we will then be giving an update on when shipments will occur. We understand that there’s probably ten people whose shipments are currently overdue, with respect to that there’s really two options: if you are looking for a refund you just e-mail info@orbo.com and we’ll sort that out for you, or can wait until we have these technical issues resolved. Thank you. Given that in an e-mail sent out to OCube buyers several days ago it was said that two OCubes had been shipped, it seems that a total of about twelve have been ordered so far. The presence of two 9 volt batteries in the OCube will send up red flags. It recalls Steorn’s Waterways demo, that was made ambiguous by the presence of batteries in a system that was claimed to produce more energy than it received. However, if the OCube does eventually ship and can be tested, the small amount of energy that is stored by two 9 volt batteries won’t make much difference. 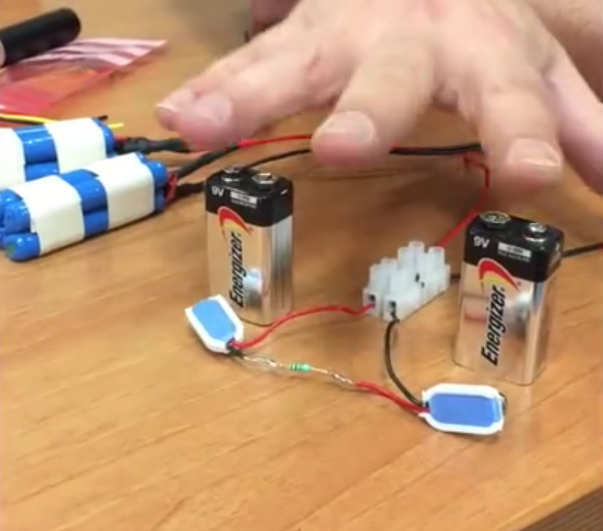 Even if the OCube were using the energy in those batteries to charge connected devices, two 9 volt batteries contain about 9 watt-hours of power, enough to charge an iPhone 5’s 5.45 watt hour battery less than twice. However, McCarthy does confirm in this video that OCubes will be potted (filled in with epoxy resin so that their components are inaccessible). This is disappointing for several reasons: it will make it impractical to test the Orbo powerpacks in isolation from the rest of the system, it will make it impossible to replace the Li-ion battery once it reaches the end of its lifetime, and now it will also make it impossible to replace the two 9 volt batteries as well. The potting thus limits the lifetime of this 1,200 euro device to 5-10 years, at the most. That’s a good bit less than the “hundreds of years” that the Orbo powerpacks themselves may last, according to an earlier video by Steorn, which would be the only limiting factor if the device were not potted and so the batteries could be replaced. Despite those disappointments, I found this video to represent good news overall. What was said is consistent with what we’ve been seeing with Frank Acland’s OCube experiments so far. Steorn wrote to Acland describing what the two sets of accessible terminals inside his OCube connect to. The first set connects to the Orbo powerpack directly, and it has been showing a slowly rising voltage over the past 24 hours. The second set connects to the reference voltage source. It should measure about 14 volts, but in Acland’s case measures 0 volts presently. The reference voltage source is said to allow the Orbo powerpack to regain voltage more quickly, so the fact that it is down to 0 volts could explain why the powerpack is recovering so slowly. Steorn has promised Acland continued support in trying to get his present OCube working, before sending him a new one at no charge once they’ve fixed the controller chip problems. The problems with the OCube have not yet been resolved, but at least Steorn has apparently identified them and is being open with the public about it — rather than vanishing from view for another five years as I half expected. Now we can only wait and see whether they get through this rough patch and begin to ship working products.